These days, everyone wants a piece of Occupy Wall Street, the anti-capitalist camp-out now in Zuccotti Park, just around the way from the New York Stock Exchange. As the organizers have stated -- repeatedly -- no one group or person gets the credit for sparking the movement. However, one instigator is clear: the initial idea came from Adbusters magazine, which put out the call via its listserv in mid-July and fomented the #OccupyWallStreet hashtag on Twitter. As such, this is one of those rare occasions where an art magazine (or something like an art magazine) has had some kind of real effect on political discourse. And a brief look back on where this message sprang from might actually offer some lessons for those commentators looking for clues as to where the movement might go. The Vancouver-based Adbusters, which calls itself the "Journal of the Mental Environment," first came on the cultural radar as an outlet for the same kind of late-'90s cultural ennui that birthed the anti-globalization movement and the third-party insurgency of Ralph Nader. Taking cues from Situationism, Adbusters promoted a strategy of semiotic interventionism called "culture jamming" -- i.e. using the language of advertising against itself as a way to disrupt its messages. The magazine's pages were adorned with sharp parodies of the likes of McDonald's and Nike, and it created some great promos for the demonstrations against the World Trade Organization in Seattle in 1999. "Culture jamming" continues to have artistic cachet -- Adbusters graphics were featured in the first Athens Biennale in 2007, in pre-meltdown Greece, alongside the likes of Assume Vivid Astro Focus and Terence Koh. (The exhibition was titled, with winking nihilism that now looks like hubris, "Destroy Athens.") However, in the decade since the Battle of Seattle, the publication has also been gradually transitioning away from its culture-jamming roots. Perhaps this has something to do with a slowly dawning realization that capitalism does not, in fact, particularly mind being mocked; perhaps it has to do more with the darkened atmosphere of the post-9/11 era. Either way, the magazine in recent years has seemed less festive, more focused on urgent political diatribes. Early in the 2000s, Adbusters started promoting a "Blackspot" line of footwear, a locally made line of shoes branded with a black smudge -- an anti-logo, if you will -- as an alternative to Nike's sweatshop shoes. Anti-advertising thus seamlessly gave way to what the magazine promoted as "antipreneuralism." This gesture drew much lefty criticism -- rightly, in my mind, since it represented a turn towards personal consumption rather than systematic critique -- but editor Kalle Lasn explains that the initiative was an attempt to break out of the limits of the anti-advertising strategy: the magazine began to realize that to be taken seriously it had to move from a position of just offering satire to offering positive alternatives. I remember talking to Lasn over the phone in 2005 to go over a piece I was writing for Adbusters's annual "Big Ideas" issue, about Alain Badiou. Lasn's relentless preoccupation, then as now, was, "what alternatives are there" given the terrible state of contemporary political discourse? This has often resulted in a publication that feels like something of an intellectual grab bag. Yet, it is the pressure of looking for alternatives that has caused Adbusters's strategies to metamorphose. Last year marked a further development, growing out of Adbusters's tenacious promotion of the annual anti-consumerist "Buy Nothing Day." Everybody knows about Occupy Wall Street now. Far fewer people know that Adbusters tried to spark a similar movement in November of last year, the so-called "Carnivalesque Rebellion," which was essentially an attempt to organize a global series of street-theater actions to bring down capitalism. "We want to set off seven days and nights of unpredictable, creative mayhem in hundreds of cities around the world," an early Adbusters "Tactical Briefing" email quixotically declared. "We want to catalyze a global flash point -- a sudden, unexpected moment of truth -- the birth of a 'slow' revolution that, over the next few years, will radically alter the way the world is run." The event was said to feature "everything from holding mass hummings in shopping centres/commercial areas to standing naked in front of our oppressors in banks carrying signs that say 'What more will you take from us now?'" "It didn't really work," Lasn told me bluntly yesterday. Despite all the ideology of the decentralized wonders of Web organizing, the effort to crowdsource revolution out of the blue failed to produce any cohesion. And, truth be told, it is possible that the global financial overlords are as unafraid of "mass hummings" as they are of snarky anti-ads. The important thing, however, is that from first parodying capitalism, and then miming it, Adbusters had progressed to attempting to challenge it head-on. In its restless quest for "alternative" big ideas, it has circled closer to the idea of old-fashioned grassroots street activism. What changed from last November to this July that caused Occupy Wall Street to catch on where Carnivaleque Rebellion flopped? Two things. One was the reality of the Arab Spring, which has shown the world an example of people power not seen in ages. But still more importantly, in my mind, is the fact that Adbusters's call to action intersected with other forces. 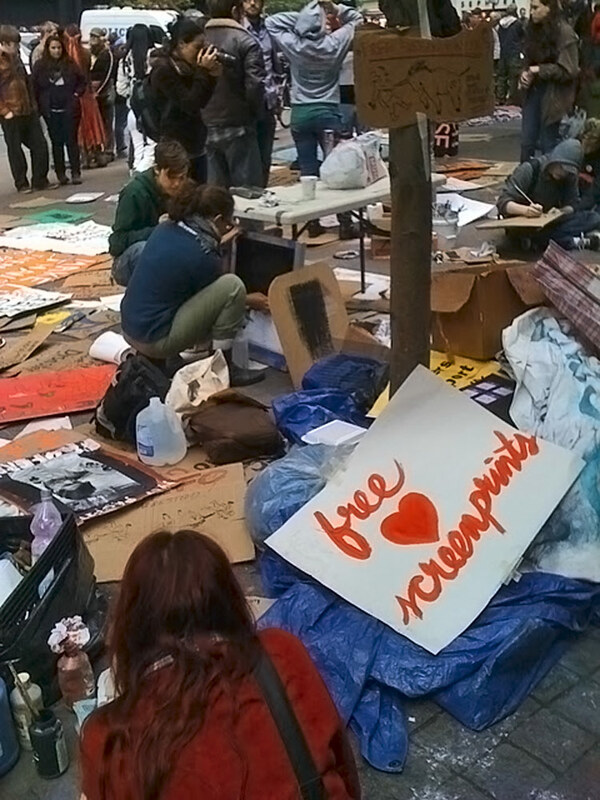 Occupy Wall Street was, in fact, preceded by "Bloombergville," a similar camp out of activists, mainly young people, who decided to sleep in lower Manhattan in July to protest the escalating budget cuts in New York. With limited exceptions, the media didn't even bother to show up to be snide about Bloombergville -- but New Yorkers Against the Budget Cuts, which helped organize Bloombergville, was early to take up the Occupy Wall Street initiative and give it some foot soldiers. This convergence is part of the narrative now, recounted by some of the protesters themselves in a wonderful publication put together by members of the encampment: the Occupied Wall Street Journal. For myself, the important thing about retracing this history is to cut against some of the notions that the movement emerged from nowhere, spontaneously. In contrast to the Carnivalesque Rebellion, Occupy Wall Street was able to draw on the initiative and example of organizations that went before. Political organization is important now, and will be going forward. 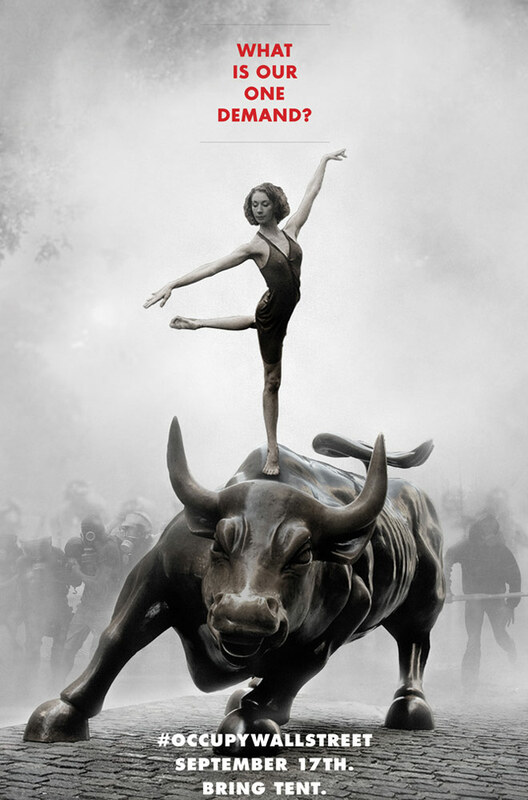 Adbusters's initial appeal for Occupy Wall Street featured a really beautiful graphic, a ballerina perched atop Wall Street's "Charging Bull" sculpture, with riot police in the background. Across it is the text, "What Is Our One Demand?" You may laugh -- as I sometimes have -- at the ideological twists and turns of Adbusters, or cringe at the sense that it is reinventing the wheel or grasping around for answers. But when it comes to addressing the reality of actual human beings in 2011, who is really deserving of your scorn? The people with the "reasonable" ideas or the people who have seen how crummy these ideas are, and decided to open a whole new conversation? You know the answer.